Afmetingen van deze voorvertoning van het type PNG van dit SVG-bestand: 418 × 600 pixels Andere resoluties: 167 × 240 pixels | 334 × 480 pixels | 535 × 768 pixels | 713 × 1.024 pixels | 565 × 811 pixels. Auteur No machine-readable author provided. MapMaster assumed (based on copyright claims). This map from Allyn & Bacon, Longman, textbook publishers. 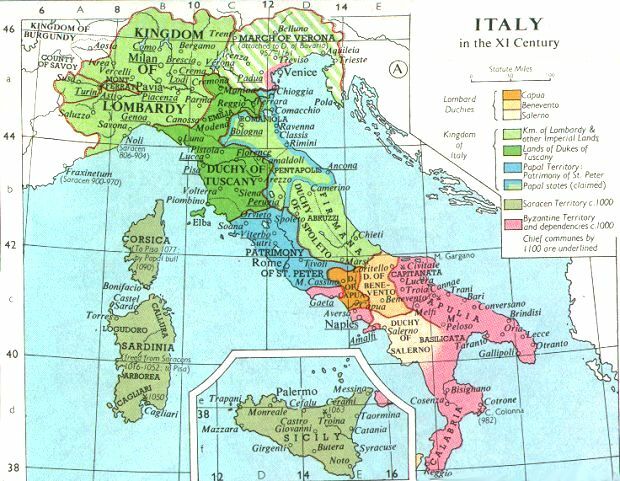 This map of 1000 AD Italy from Fordham University, adapted from Muir's Historical Atlas, (1911). 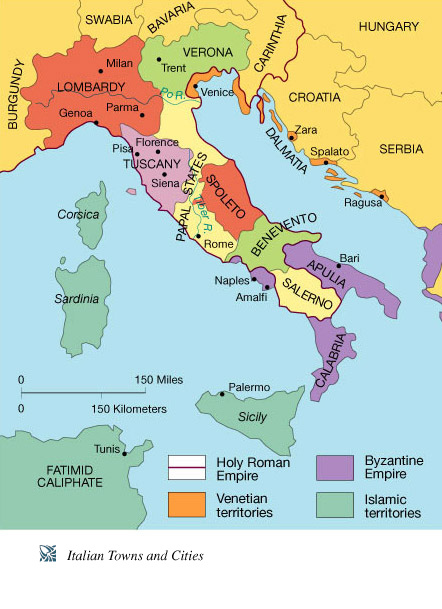 The extent of Venetian control over the cities of Dalmatia such as Zara and Spalato. Although the Venetians had been pushed off the mainland earlier, in the period around the year 1000, the Venetians made an effort to recover these cities. The extent of Saracen control over Corsica and Sardinia. Information is sparse. The apparent situation is that the Muslims had several bases on the coasts of these islands, but did not control the countryside (such as they did in Sicily). 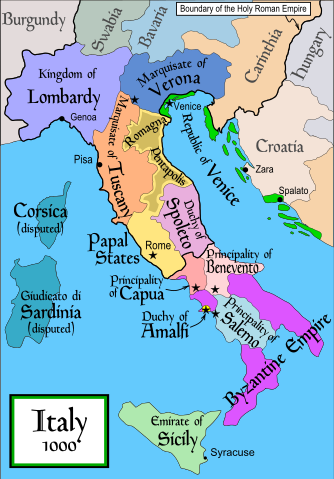 Whether or not the principalities of Capua and Benevento were separate states in the year 1000. Based on lists of their rulers (various Pandulfs and Landulfs), the answer seems to be "yes". Who controlled the Balkans on the southeastern border of the Kingdom of Croatia. Candidates include Bulgaria, the Byzantine Empire, Croatia, and Serbia. As noted, there is significant disagreement among sources on these questions. This map was commissioned by Attilios, and there is also a discussion to be found on MapMaster's English talk page. 25 nov 2006 07:39 565 × 811 (823 kB) MapMaster Improved map. 18 nov 2006 16:44 565 × 811 (827 kB) MapMaster Improved (I hope) version based on recommendations from Attilios. 17 nov 2006 23:50 565 × 811 (768 kB) MapMaster Political map of Italy in 1000 AD (CE).